This Chicken curry comes from south canara region of Karnataka. It is very commonly made in Mangalore. 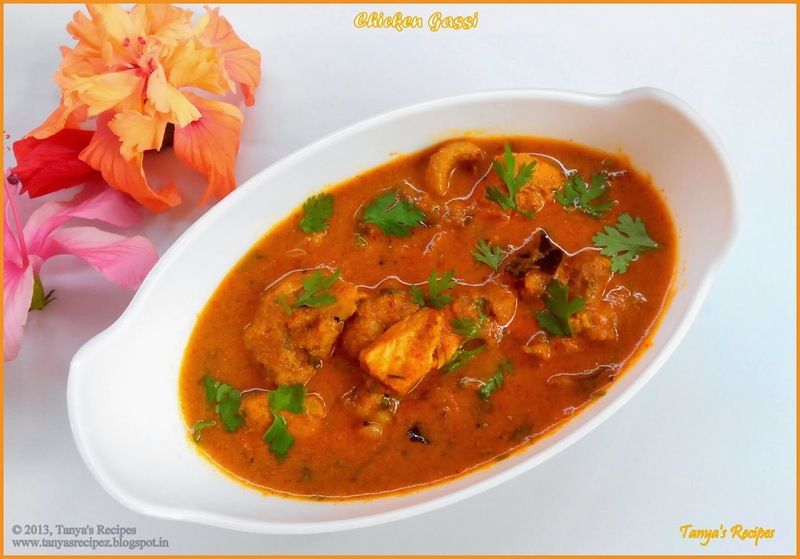 It has a very flavorful combination of red chilies, coconut milk and curry leaves. Marinate the chicken with lemon juice, turmeric powder and salt. Keep it aside for half an hour. Dry roast the grated coconut till slightly brown and remove it in a plate. To the same pan add coriander seeds, cumin seeds, black peppercorns, fenugreek seeds and dry red chilies and dry roast till fragrant. Grind the roasted coconut and spices along with onion into a fine paste. Add some water if needed. Now heat oil in a pan and add mustard seeds and let it crackle. Add curry leaves and garlic cloves and saute till fragrant. Add onion and saute till it turns pink. Add the ginger-garlic paste and above ground masala paste and saute till oil separates. Add marinated chicken and saute for a min. Add some water, tamarind extract and salt. Check for seasoning. Cover and cook till the chicken is completely done. Once done uncover the lid and add coconut milk. Cook for another min and adjust the consistency of the gravy. Garnish with coriander leaves. Serve hot. ü Do not roast the coconut for too long. It just needs to turn into very light brown color. ü After adding the masala paste if it bubbles too much then cover and let it cook till the masala gets fried well and oil separates.